Over the course of three long days of poker, 2,714 players have come and gone. At the end of it all, one man is left standing with every chip in play. The man left is Ray Foley, a proud native of Michigan. Foley put on a poker clinic in this minefield of questionable play. Managing to survive Day 1, Foley really began to assert himself on Day 2. He held the chip lead for much of that second day, just narrowly being edged out for the top spot as play concluded. Foley would pick right up where he left off today. 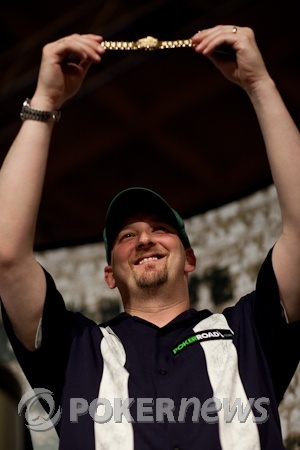 Facing a formidable final three tables, Foley continued to pick his way through the field. 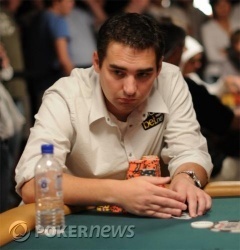 At the final table, he got fortunate with a favorable seat draw, sitting to the left of Brandon Cantu and Alex Jacob. Foley would knock out Jacob (after the afro-headed pro had already taken a big hit), and now he has dispatched of Brandon Cantu. The pivotal hand came just about a half hour into heads-up play. Cantu had been grinding away at Foley, and he moved all in with king-nine with a chance to end the tournament. Foley had pocket tens, but a king on the flop nearly put the bracelet on the wrist of Cantu. If not for a miraculous ten on the turn, that's the way it would have ended. But it wasn't meant to be for Cantu. After a remarkable three days of poker, Ray Foley has earned himself a shiny gold bracelet and more than $650,000 in cash. 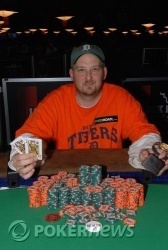 Congratulations to Ray Foley, Event #39 Champion! Brandon Cantu raised to, you guessed it, 305,000, and Foley made the call to see a flop. It came down , and fireworks ensued once again. Foley checked, and Cantu put out 450,000 more chips. After just a quick pause, Foley moved all in, sending Cantu into the tank. After about a minute, Cantu shrugged, nodded his head and made the call for his own tournament life. Cantu seemed to know what Foley had before the cards were even turned over. Looking to pair his seven, Cantu would find no help as the and filled out the board. With his pair of jacks, queen kicker, Ray Foley has eliminated Brandon Cantu in 2nd place. For his impressive run, the pro will take home more than $400,000 but fall one spot short of his clear goal. Since that last big encounter, Brandon Cantu has given Foley a walk in the big blind three straight times. He's understandably looking just a bit frustrated over there. Ray Foley raised to 300,000, and Brandon Cantu moved all in. Foley snap-called for his tournament life. The crowd pressed in on the table, jockeying for a good view of what could be the final hand of the tournament. "King, please," asked Cantu. And the dealer obliged him. The flop shot out , drawing a huge reaction from the crowd and Cantu alike. Brandon couldn't stand still, pacing around the table with his hands clenched to his face. Another huge reaction, this time from the other side of the arena. Foley had come from behind, spiking his two-outer to lock up the pot and a massive double up. 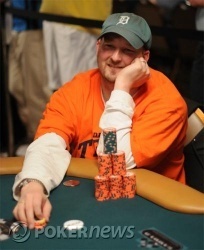 He had 4,060,000 to start the hand, and that earns him a double to 8,120,000 as the two men essentially trade stacks. Cantu came in with his usual raise to 305,000 from the button, and Foley put in the call. The flop showed up . Foley checked, and Cantu's bet of 400,000 earned him the pot. Foley has been whittled down to the 4,000,000-chip mark. Ray Foley limped in from the button, and Cantu knocked the table for the free flop. It came , and they both checked. The turn was the , and it drew a bet of 275,000 from Cantu. Foley raised it up to 650,000, and Cantu made the call. The river came the , and both men checked once again. "King," said Cantu, and Foley mucked his hand. was shown down, and Cantu takes another big bite. Cantu raised to 305,000 from the button again, and Foley came along. The board ran out with the two men check-checking through fourth street. On fifth, Cantu put in a bet of 400,000, and Foley eventually made the call. Brandon showed , and it was the winner. He's now sitting right at 7,000,000 in chips. 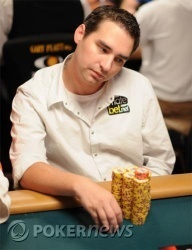 Brandon Cantu raised to 305,000, and Foley three-bet it up to 900,000, drawing a fold. On the next hand, the two men saw a cheap flop of . They both checked there, as well as on the turn . When the hit the river, Cantu bet 300,000, and Foley called. Brandon showed , good enough to win the pot. Ray Foley limped in from the button, and Brandon Cantu raised to 300,000. That prompted an all in from Foley, and Cantu snap-called with a chance to end the night! The flop came safe for Cantu, running out . When the hit the turn, Cantu pressed his hands into his cheeks, fearful of his opponent's open ender. The river didn't make Foley's straight, but the was still a beautiful card for him. With two pair on the board, the players chop up the pot with their ace kickers. No chips change hands, and it's on to the next shuffle.